Take 300g of pumpkin, keeping the skin on, remove the seeds and if necessary cut it into medium cubes. Steam the pieces for around 15 minutes until tender. Cut the Comté cheese into small dice or grate it. Infuse the cream over a low heat in a saucepan with mustard, pepper, salt and the grated nutmeg. Mix with a whisk to obtain a good consistency. Avoid boiling to make sure it doesn't coagulate. You only need to infuse the spices. Pour a little cream into each mini-cocotte. Add the pumpkin and the Comté cheese. Put some more of the cream on the top. 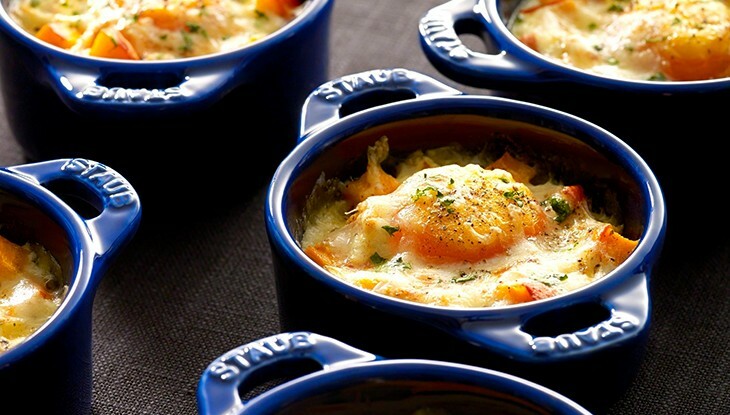 Carefully break an egg into the center of each mini-cocotte, taking care not to break the yolks. Add some Comté shavings, and salt and pepper the eggs. Put in the oven and bake for 10-15 minutes keeping an eye. The egg should be cooked but preferably still runny so you can dip your bread in the egg! Eat it warm with some finely chopped herbs and some nice crusty bread. Some chopped walnuts on the top will give it a tasty autumnal touch.